Now, to reach this stage, we here at Om Yoga, teach theoretically and practically many diffrenent techniques of this sadhana like Asanas, Pranayama(Breathing Teechniques), Bandhas, Mudras, Shatkriyas, Chakras Beej Mantra Sadhana, Chakras Symbol Sadhana, Chakras Healing etc.. in 11 days, 50 hours. How to Practice, what is required for this practice, what cautions to be taken while doing this sadhana, limitations of this practice. This teaching of 11 days 50 hours has to be carried in your daily routine as it requires a daily practice.Its practice continues till the time you reach your destination. Kundalini Yoga as taught by Yogi Bhajan is the Yoga of Awareness. Kundalini Yoga gives you tools to expedite your spiritual growth and healing. Kundalini Yoga also provides physiological as well as psychological well-known benefits such as increased flexibility, expanded lung capacity, a strong core, and stress alleviation and much more. In our body, we have different types of energy present related to five elements and then sixth sense and atlast, universal energy. By doing Kundalini Yog sadhana, these energies(earth energy, water energy, fire energy, air energy and sky energy) increase which were blocked in their respective centres one by one and then, sixth sense unblocks and atlast, our energy unites with universal energy. When all these energies gets unblocked, we start receiving benefits of each and every energy correspondingly which is infinite in number. 1.Inner Guidance: Kundalini Yoga develops the power of the intuitive mind. When you clean out the subconscious mind and learn to listen through deep meditation, when your thoughts and feelings resonate with the soul, you can sense the guidance of intuition that is always present. 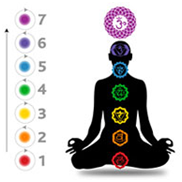 2.Protection from negativity: Kundalini Yoga practice fortifies and expands your electromagnetic field, or aura. It is the energy field that surrounds you, and that alerts you to positive and negative influences in your environment. A weak aura can let in negative influences, and even attract them. A big, strong, bright aura can protect you from negativity and keep you centered in the light of your true identity. 3.Emotional Balance and neutral mind: Kundalini Yoga strengthens the nervous system, balances the glands, purifies the blood, and cleans out subconscious thought patterns. This gives you greater awareness and ability to choose how you respond to your thoughts and feelings. Through practice, you can train your mind and body not to react emotionally—not by repressing emotions, but by developing a buffer zone, a time and space in which to process and make conscious choices about your responses. Develop the neutral mind, the place where the positive and the negative are evaluated in an instant, and you can act from that state of non-attachment, compassion, and neutrality. Act, don’t react. 4. Deep Relaxation That Heals: Kundalini Yoga practice helps you to becomes physically and mentally relaxed and also teaches you to self-heal yourself with this. 5. Befriend your soul and manifest your destiny: Kundalini Yoga gives you an experience of who you are when the grip of ego is released. It allows the depth of the soul to be felt and known. Begin to access your truth and create a strong connection to your soul and your soul’s work in this lifetime. Kundalini Yoga is an experience of uniting the finite self with the Infinite. Once you gain this experience, you no longer have the need to look for your security outside of yourself. Your security comes from knowing who you are in relation to the Universe. You know who you are, and you can be you. You can leave the pain of past wounds behind, and manifest your soul’s destiny. Following the ancient Indian yogic tradition, Om Yoga International offers 50 hour Kundalini Yoga course registered by World Yoga Alliance. All the activites carried at our ashram are purely sattvic that gives an atmosphere to the students to gain the essence of spirituality. Thereby, maintaining a stress free environment for our students that helps them to gain best results in a minimal time. We have well specialised experts for Kundalini Yoga, Mr. Radhika Sharan and Mrs. Ruchika Sharan who ensure proper guidance to all our students in a well systematical manner. All our theoretical concepts are supported with practical. The best benefit that one will get by doing this course from Om Yoga is personal attention from the teachers. This course we never organize in big groups. We keep small groups to give individual guidance to each and every student.